Special to the Journal/Jimmy Joe Savage East Liverpool’s Gabe Roach drives in against Minerva’s Brice WiIliams at the Potter Fieldhouse on Friday night. EAST LIVERPOOL–Coming off a thrilling win against Harrison Central on Tuesday and with the Ohio Valley Athletic Conference semifinals looming next week, the East Liverpool boys basketball team made it very clear that there would be no letdown Friday against Minerva. 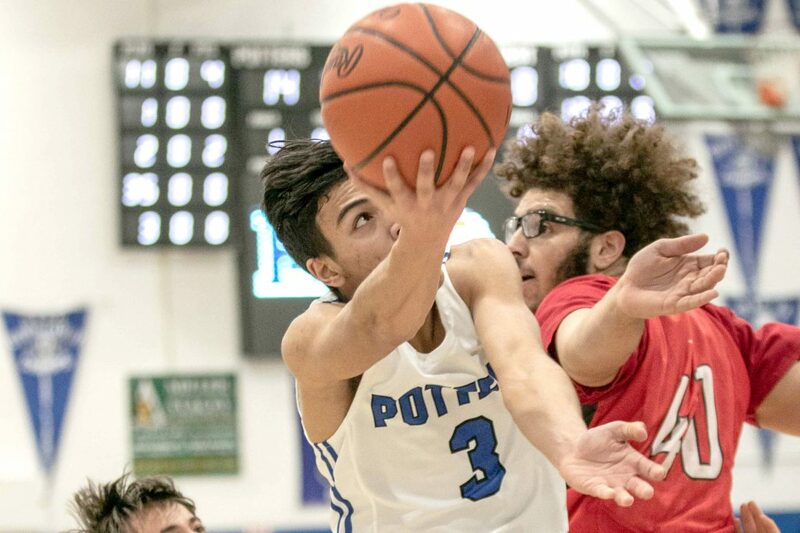 On senior night at Potter Fieldhouse, senior guard Gabe Roach put together one of his most complete performances of the season with 29 points and 14 rebounds as the Potters took apart the Lions in the first half and cruised to a 79-51 victory. Roach helped set the tone for the Potters (15-4) by attacking the basket early and often. He hit his first four shots, had thirteen points by the end of the first quarter and already had a double-double secured by halftime when East Liverpool went to the locker room up 39-18. Roach was far from alone. Timmy Neal added 13 points, while Tresean Jackson totaled 11 points and six assists. James Maxwell pulled down six rebounds. Brennan O’Hara and Tyler Roe each had five boards. After surrendering 18 second-chance points to St. Clairsville in the Buckeye 8 Championship game Saturday, the Potters made it a point to re-emphasize the fundamentals. They owned a dominant 41-19 edge on the boards Friday. The Potters only hit one three, but made up for it with their relentless transition attack and a sturdy defense that held the Lions to 4-for-25 shooting in the first half. Minerva found some rhythm in the second half, but by then it was too late. Standout forward Brice Williams led the Lions (6-14) with 21 points. Minerva is at Marlington on Friday, while the Potters now turn their attention to Tuesday’s OVAC 4A semifinal at top-seeded Meadowbrook (13-4) which was a Div. II state semifinalist last season. The one common opponent between the two schools is Steubenville, which Meadowbrook beat 59-45. ¯ Prior to the game, Jackson was honored for breaking the school record for career three-pointers Tuesday against Harrison Central. Jackson, who did not hit a three on Friday, now has 153 career threes. The old mark was 152 by Josh Reed (Class of 2003). ¯ East Liverpool honored all winter sport seniors before the game. Conley opened the game with all four seniors (Roach, James Maxwell, Peyton Reed and Sobaan Razi in the starting lineup. ¯ After the game Green said the Potters stacked up favorably against the teams the Lions face in the Eastern Buckeye Conference. ¯ The Potters won the JVgame 57-44. Levi George had 15 points for East Liverpool. Shea Common led Minerva with 13 points. MINERVA SCORING: Reece Catlett 5-1-11, Brandon Baumgardner 3-0-7, Noah Sallade 1-0-2, Brice Williams 5-9-21, Mitchell Greer 0-0-0, Alex Kimble 0-0-0, Blake Kinsey 2-0-6, Owen Swogger 0-0-0, Koby Kinsey 0-2-2, Shea Common 1-0-2. TEAM TOTALS: 17, 12-14: 51. EAST LIVERPOOL SCORING: Gabe Roach 12-4-29, Tresean Jackson 5-1-11, Timmy Neal 6-1-13, Brennan O’Hara 2-1-5, James Maxwell 2-1-5, Peyton Reed 4-0-9, Tyler Roe 2-0-4, Izaiha Browning 0-1-1, Levi George 0-0-0, Sobaan Razi 0-0-0, Jerome Deal 0-2-2, Zavea Green 0-0-0, Cameron Beverly 0-0-0. TEAM TOTALS: 34, 11-18: 79. Three-point goals: Minerva 5 (Blake Kinsey 2, Williams 2, Baumgardner), East Liverpool 2 (Roach, Reed).